Happy 4th of July, Ladies! Currently, I'm dc'ing with Redken!s Smooth Lock Butter Silk & Redken's Extreme Strength Builder on dry hair. I have to run out and do a few errands before the family cookout later. I really like both if these products! I use the 'butter' when Cleo is tangly and it's just like silk. The strengthening one I use primarily for my ends and older parts of my strands. It really helps with keeping them strong. I know it's National Afro day today too. So, I'm contemplating a curly fro or Mohawk for today's hair. Please be safe and enjoy the long holiday weekend! Heyyyy, Hunnie Bunnie!!!! You are too funny, Missy! I will try and post pics soon. I'm still hit or miss when it comes to posting and taking pics. Sometimes the mood strikes me heavily and quickly fades. How's ya mane doing these days? I know what you mean about taking pictures...I take more pics on my phone that wth my camera or IPAD. My hair is doing better, I am going through a terrible shed due to radiation and stress...I wish either would make me lose weight, but NOPE . I really miss talking and sharing hair advise...it seems this place has become a ghost town. By the way, the few pics that I did see shows that your hair is gorgeous...I LOVE IT!!! Bunnie, you know how it goes around here...ebbs and flow. I know you been in the game long enough to know that you got that shedding under control. Shoot, you handled radiation like a champ! Push tosh on some shedding! How's ya protein/moisture looking ? Is ya shedding mild or heavy? Cleo is currently basking in an intense dc. I think it's been about two or more weeks since my last one. The last time I attempted at a dc and detangle was a few weeks ago. I had been wearing Cleo in heavy puff rotation and knew she lived in tangle city. So, I did a half assed detangle/dc session and puffed her back up. Throughout the half assed-ness, I still watered and moisturized and repuffed. She was so soft and the look and feel of it reminded me of my childhood hair. But, I most definitely know I needed to do a thorough detangle. Like I said, Cleo was heckuva soft! My detangle session was effortless! I dc'ed on dry hair and I did a combo moisture/protein dc: moisture dc thought the sections and protein dc on midshaft to the ends of Cleo. Detangled with my fingers and f/u'ed with my wide toothed comb. Twisted each section into a bun and shower capped. Hopefully, I'll have soft yet strong hair. This week is looking like a plait out week. I should be atleast APL right now , but I've had major setbacks!! Hey Ladies! Currently, baggying Ms. Cleo in her Princess Leah buns. Last week, I had my stretch on! I had rocked my Princess Leah buns for two days. Then, took them down bc they were fully dried and brushed them out with my paddle brush. Gave me great stretch! Rocked a ballerina bun the rest if the week.It almost looks like I gave her a medium blow out and touched her up with a light hot comb. Keeps the tangles and ssk's down. So, I'll most likely do this for the rest of the Summer or keep it going. Really easy, good for Cleo and I luv me some buns! 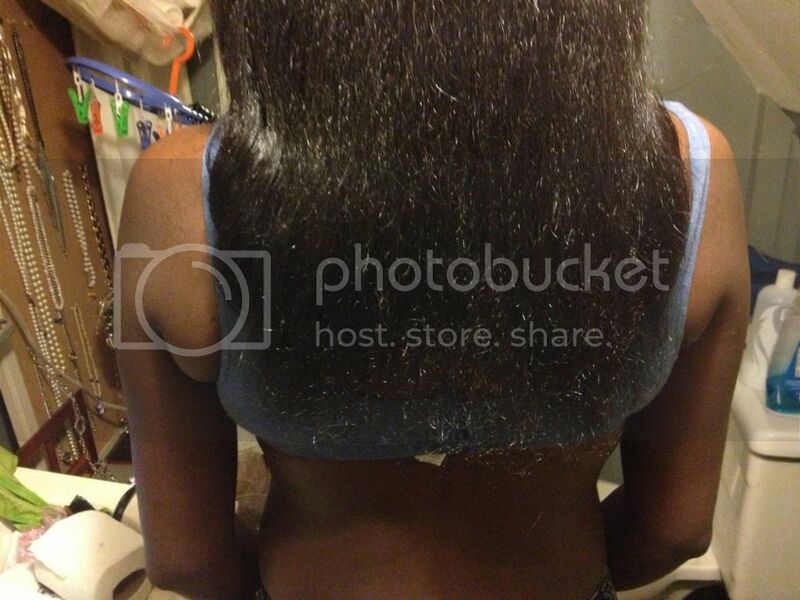 @ladyduzy: glad to hear your mane is back on track! You'll be APL before you know it! Idk if you experience a growth spurt during the Summer, but if you do take advantage. I know that APL-BSL for me was the hardest length hurdle! It took forever to get to BSL. What really helped me was consistent bunning. I was finally able to get over that hump. Keep us posted on your mane! GL! GM Ladies! Took off today and tomorrow for Family Fun Day(s)! So need a break from work and just enjoy my guys! So, I told y'all I've been rocking Cleo in a stretched ballerina(sometimes messy) bun. I'm truly luving the ease of it. It's a classic look and my Fav PS(if ya don't know- LOL). When I'm unwinding, I just push the rubberband further up and it gets looser and bigger! I luv how the shape of the bun can change depending on how I twist the hair to form the bun! I consider myself a length lover, but I absolutely adore updos, specifically buns, and I'm style challenged. So, the bun is my signature style. Yesterday, I was teasing my manchild(he's 10) about not coming to see if I was home from work. I usually go to his room and say I'm home, bit I just wanted to see if he would emerge from his Lego haze(he didn't- lol). So, he tells me: Mama, how does your hair fit in that bun one minute and a few months later its down your back like a waterfall( he calls my straight Cleo a waterfall)? I lol'ed and told him about a hot comb/flatiron (briefly). He said he luves my hair any way I wear it. Awwwww! I hope he keeps his appreciation for hair of all types as he grows older! Hope u all enjoy this beautiful day. Heading back to sleep for awhile. I've been throwing my hair in a high top bun lately. Seems like I've been seeing a lot of ladies doing it so I started. Love the ease. But, I pay when it comes to doing a thorough detangling. Washed my hair 3 nights ago, spending hours detangling in the shower and just finished detangling tonight. I think it's from pulling my hair into buns. Even so, it was still worth the convenience.